When it comes to picking the best burgers in the entire state of California, there really are no losers. Unless you only pick 19, in which case there are, like, THOUSANDS of losers. 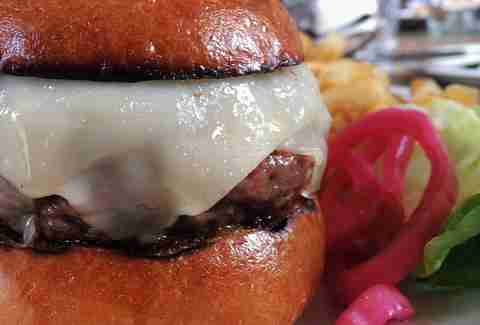 Annnnnnyway, here are the 19 best burgers in California. It's one of those burgers that's built on ratio: the Niman Ranch patty's thick, but not too thick, the bacon just crispy enough, the cheese flavor-enhancing without being flavor-overpowering. And it's made all the more exciting by the fact that you're eating it in what amounts to a no-frills storefront that -- even with all the hype -- still feels like a secret find. You know that guilt you feel every time you eat a Big Mac: you sort of like the flavor in a nostalgia-for-being-a-little-kid way, but you also know that it doesn't actually taste, you know, good? Feel that guilt no more: The Larchmont is the grown-up Big Mac you never knew you wanted, covered in buttered onions, cave-aged cheese, and that "secret sauce" that's clearly Thousand Island dressing with... something you just can't put your finger on. Also, the patty is insanely juicy. Also, unfortunately, no sesame seeds. It takes some effort to get to this roadhouse on the way to Joshua Tree, but man, is it worth it: not only do you get awesome desert scenery, but you'll be in one of the coolest rooms in all of LA -- a rustic-but-somehow-impossibly-hip BBQ spot with a killer Angus burg, topped with homemade chili that tastes like history and love, COMBINED. Whether you’re heading to Big Bear to hit the slopes and drink in a lodge or hit the trails and drink in a cabin, you're gonna need to stop in and get the burger (seriously) at this ‘50s-style shack. The Director is the move: two 1/4lb patties sizzled on the griddle with American cheese, grilled onions, crispy lettuce, tomatoes, and the "special sauce" -- though they've also got an all-business semi-secret menu, where you can get that dude Raccoon-style (banana peppers and extra onions), FX-style (grilled in mustard, extra spread and pickles), or Spicy-style (grilled in spicy sauce and jalapeños). Oh, and the tater tots smothered in cheese, sour cream, chives, and bacon bits? Also, obviously, well worth the investment. One of those greasy spoons that are increasingly hard to come by in Marin, this spot -- a one-story little shack on a main thoroughfare in San Rafael -- sticks out like a sore, delicious thumb in the land of gluten-free, on-a-juice-cleanse soccer moms. But that's part of why it's great -- that and it delivers a no-frills burger, thick fries, and thicker milkshakes. Burgers are made with 100% chuck from Niman Ranch beef and come out juicy on the inside with crispy, jagged edges that come from being fried in excess oil on a well seasoned and ancient stove. It’s shaped like a hot dog, okay? So just know that going in. 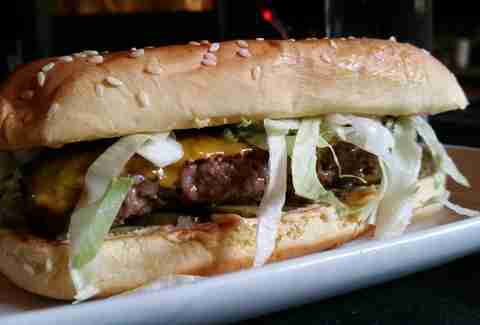 But once you’re done wrapping your mind around that, and the fact that you’re eating it in one of the best cocktail bars in the country, you can just enjoy the toasted sesame bun packed with a house-ground blend of brisket, sirloin, and chuck, plus cheddar, shredded lettuce, pickles, and house sauce. Also, maybe get a cocktail, too? Most skirts are made out of cotton, or wool or something, but not this one. Basically, if you ask for the cheese skirt at this iconic burger shop (and you have to ask for the cheese skirt, right? ), they cook your burger with, like, a seventeen foot (NOTE: estimate not to scale) mess of cheddar crisped up around it (the process involves ice cubes and steam). On its own, the burger is a pretty decent, grilled 1/3lb burger with a sourdough bun, but again IT HAS A GIGANTIC SKIRT OF CRISPY CHEESE AROUND IT. 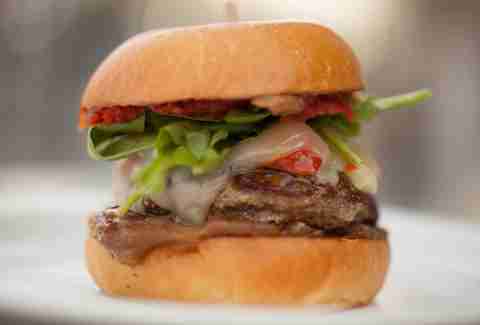 No burger in SF gets more hype than the Nopa burger, but in the case of this juicy, wood-grilled masterpiece, it's well deserved. The chuck (grass-fed) is ground daily and for each pound of meat, a teaspoon of salt is added -- which sounds like too much, but is not even a little bit too much because: flavor. Add a house-made brioche bun (toasted, of course), house-pickled onions, Little Gem lettuce, harissa aioli, and cheese and -- bingo-bango -- hype machine burger. First things first: no one calls this Redrum; rather, it still unofficially goes by it's original name: Murder Burger (some community members in a second location that only lasted a year objected to the name blah, blah, blah). Second: while it's famous for the ostrich and bison burgers, you can't go wrong with the classic, 1/3lb 100% ground chuck burger that comes with mayonnaise, mustard, lettuce, tomato, pickle, onion, and cheddar cheese, all on a fresh-baked bun. Oh, and order a shake while you're at it. They're made with fresh fruit, so drinking/eating one is basically the same thing as going on a jog. Though The Peg House is technically in the middle of nowhere, there's also a good chance you'll have to pass it on your way to somewhere. 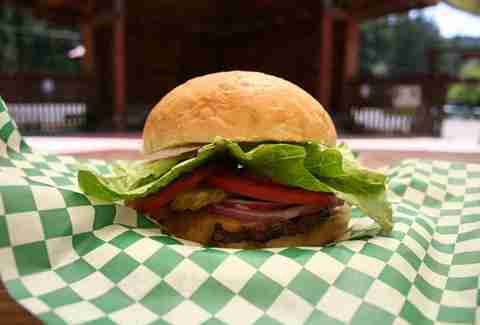 When you do, pull over and order the Sunset Burger, made with Humboldt grass-fed beef. And the BBQ oysters. And, um, some brownies. 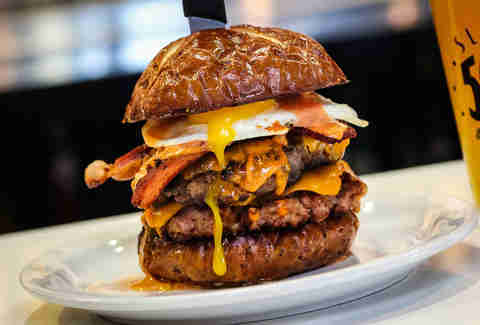 But mostly the Sunset Burger, which is made to-order on the grill and comes out juicy and topped with bacon and cheese. It might have something to do with working up an appetite after a full day of snowboarding, or it might have to do with the friendly service and chill bar scene with 15 beers on tap, but there's just something really delicious about the burgers at the BT. You can't go wrong with the bacon cheeseburger (8oz beef patty), but you'll also be tempted by the all-natural bison burger, the Rocky Mountain elk burger, and the open-faced chili cheeseburger. That won't be the only tough decision you make, 'cause you're also gonna have to choose between waffle fries and tater tots. Hodad's got its start on Ocean Beach in 1969, and has grown into a San Diego institution (you can even find them in Petco Park). Be prepared for a line out the door if you get there during peak meal times, but it's well worth the wait. The burgers are available in mini, single, and double... so, double. And maybe tack on a mini for dessert. You can get a little creative with extras if you like (there's a Guy Fieri-inspired Guido Burger rocking pastrami), but don't if you get the simple, hulking, beefy bacon double. Oh, and save room for a shake. Or don't, it's your life. As you can tell from the name, this place is all about the bovine, from delicious outside-the-box ice creams (jalapeño cream cheese?! 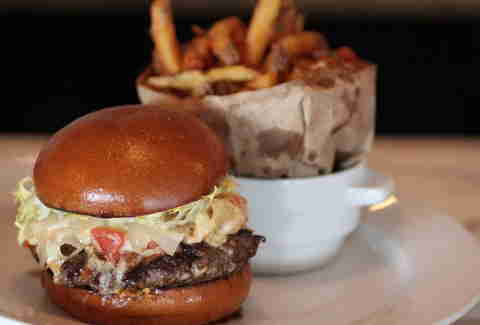 ), to super-serious burgers laid on fresh-baked brioche buns with scratch-made toppings and a custom beef blend. It's hard to make a wrong turn on the burger menu, especially if that turn is into the Spanish chorizo burger (with manchego, date spread, pepper relish, and caramelized onions). This on-the-way-to-Tahoe roadside diner has a sign out front that reads, "Tasty Burgers / Fresh Fruit". We can't confirm the latter, but, oh man, the former, yes. Especially when it comes to the Ultimate Big Burger, which delivers on both the "ultimate" and "big" with two oblong beef patties stacked carefully on a toasted French roll with thick bacon slices, avocado, soft grilled onions, sautéed mushrooms, melted cheddar, lettuce, tomato, and special sauce. Open since 1977, Rocky’s is as traditional as it gets. It only takes cash, and the burgers taste the way burgers should taste. That means you don’t need to get all fancy with toppings and extras: your options consist of 1/3lb or 1/2lb, and hamburger or cheeseburger. Your perfect patty will come with the standard trimmings and you won't even be able to fathom needing anything else. 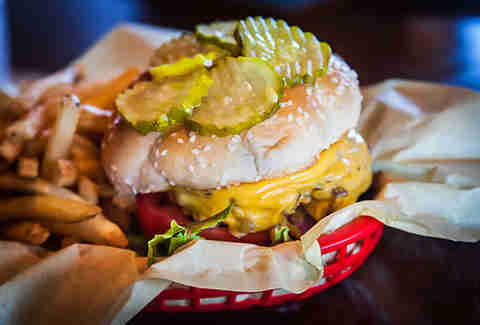 One wrinkle: at Rocky’s, the burger builders do what they want; so instead of going IN the burger, their pickles are placed ON TOP of the bun. This burger is on enough "Best Burger" lists that it's reached "duh" status, but it has earned that "duh". 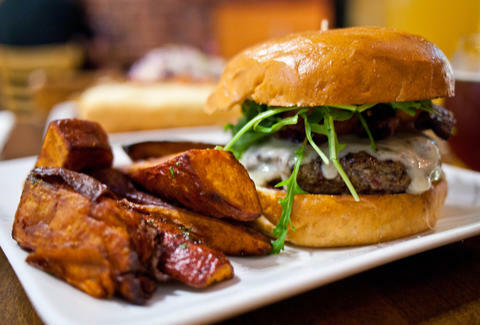 The heavily sweet caramelized onion, Gruyere, Maytag blue, and arugula sit perfectly on a beef patty between two sides of a freshly baked roll. It's a good enough combination that the staff won't let you substitute any part of it. Ever. And they're kind of right. You could go with the standard 50/50 Burger and things are already getting pretty interesting: half-bacon and half-burger, ground together, topped with a sunny-side up egg. And mashed avocado. And chipotle aioli. On a brioche bun. Of course, if you REALLY want to explore the outer limits of what a burger can be, you could try monthly specials like this. Or this. Or this. These guys do not skimp when it comes to burger creativity (and calories). Talk about living up to its name. A two-time honoree on our annual 33 Best Burgers in the Country list, 4505's Best Damn rests Magruder Ranch beef on a perfect, not-too-thick sesame-scallion bread product that teeters on the edge between bagel and bun, along with Gruyere, dry-aged beef, red onion, and special sauce. 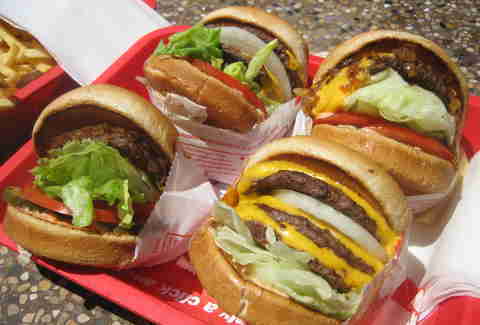 Lets face it, In-N-Out isn't just one of the best fast-food burgers around, it's one of the best burgers, period: the buns are perfectly moist, the cheese is perfectly gooey, the patties are perfectly cooked, and the lettuce is perfectly crispy. You'll be told to order it Animal Style, and that's not 100% wrong, but if you want it to sing sweet love songs to you, just get it the way it was delivered when In-N-Out was founded: with an onion that brings out the flavor of the beef, and makes you crave it again and again. NOTE: Grant Marek, Matt Lynch, Kevin Alexander, Sara Norris, Danny Jensen, and Amy Copperman also contributed to this story, and all eat a moderately alarming number of burgers.